Move over poi and luau pig on the Island of Hawaii, Pueo’s Osteria Italian restaurant is on the radar more than the spouting volcano. Neatly tucked away in an older Hawaiian style courtyard, the eatery evokes the feeling of being in Tuscany. Reminiscent of a villa, with soft yellows, muted green stone wall and an archway shaped like a wine cellar, it’s an inviting Italian atmosphere without Americanized Italian music in the background. I introduced myself to Chef James Babian who welcomed me before the restaurant opened for dinner. Like the final rehearsal at the symphony, the kitchen was abuzz with sorting, prepping and maintaining a tight schedule. Tables were set, the gathering high bar was organized and the bartender arranged glasses and wine bottles. The activity was indicative of a busy evening to come. Restaurants are a second home to owner and Executive Chef Babian as he grew up in his family’s east coast restaurants, attended culinary school and later became the Executive Chef at the Four Seasons, Hualalai, Hawaii. A few years ago he and his wife Christine, decided it was time to open their own restaurant, and together they settled on a vacant restaurant in Waikoloa Village. Located in a family community and off the beaten track from tourists, it’s on the western side of the Big Island. Reservations have become a must and those who have to wait for seating can peruse the entry walls lined with Chef Babian’s impressive culinary awards and certificates for community involvement. Over the years he has garnered accolades and respect by well-known chefs who have donated their services and worked together for charitable causes. One such occasion was the Made in America Cookbook event with recipes by celebrity chefs. The pride of the kitchen is a propane wood-fire pizza oven for consistent temperature and work stations for making pasta by hand. Once a week, a big wheel of parmesan cheese rolls in and the finest Italian ingredients are delivered. When he puts his name on a signature dish, it has to be the best for his customer’s dining experience. He believes his patrons get value for the price of the meal without skimping on portions or preparation. Chef developed a concept of regional, seasonal and artisanal food (RTS) at his restaurant and buys locally-sourced produce, beef and seafood. It’s a top priority for him to keep area farmers supplying the freshest ingredients such as beets, greens and tomatoes from the rich volcanic soil. It was time for Chef to tend to the kitchen and I decided to dine at the bar partaking of “early owl specials” and Italian wines. A partially open kitchen allowed me to watch Chef prepare fresh pasta by cracking the eggs into a mound of flour and using a hand- crank pasta roller. There were plenty of cooks in the small kitchen, but Chef didn’t stray far from overseeing the formation of my antipasto platter, layering fresh burrata cheese over locally-grown tomatoes and topping house-made fennel sausage on a rustic pizza. The pace of the restaurant picked up quickly as guests swarmed the tables and Christine bustled through the dining room serving wine and attending to guests on the patio. She adeptly divides her time between the restaurant, real estate job and two teenage sons. Together, the couple ensured that all ran smoothly throughout the night. A woman sitting next to me and wearing stylish aloha attire, was on her way to the airport for a red-eye flight home after staying at a resort on the Kohala coast. She just had to have one more Waimea kale salad while her husband was a bit more adventurous with the menu. During their vacation they had been at the restaurant many times; this turned out to be the common thread among diners. Curious about the name Pueo, I learned it comes from an indigenous owl which represents the restaurant’s desire to stay open late at night when other restaurants are closed. Specials after 9 p.m. are geared for the working persons on their way home from long work days. The Wednesday night special is burgers and fries for $6, along with bolognese calzone, calamari fritti and pizza. 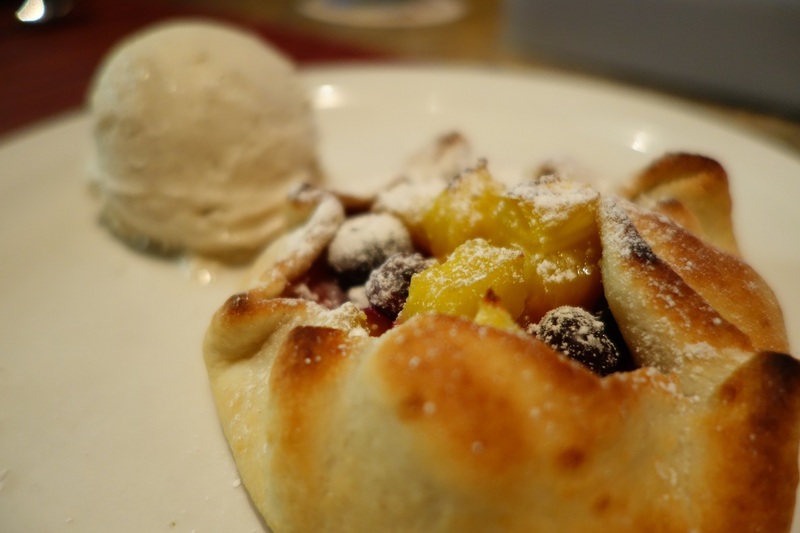 And no matter the time, there is always room for dessert, especially the crostata pastry filled with pineapple and blueberries and served with locally made vanilla ice cream. 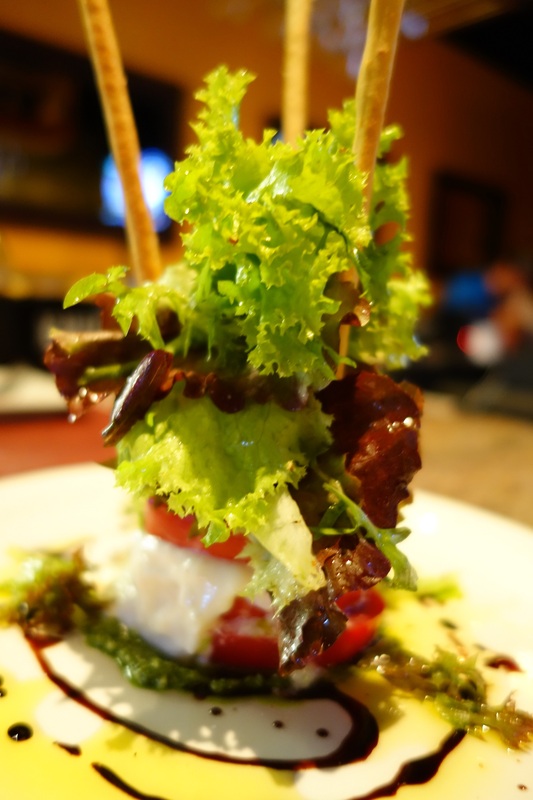 Next time I will skip the luau and drive straight to Pueo’s Osteria. Chef Babian included recipes for Gnudi (gnocchi) and lemon mint sauce. There may be leftovers to enjoy next day. Drain the ricotta overnight. Mix the flour, parmesan, nutmeg, salt. Make a mound with the ricotta and flour mix. Add the egg to the middle and mix to combine making sure not to over knead the dough. The dough should be slightly tacky but not sticky, Adjust with additional flour if needed. (Egg sizes and the moisture in the cheese varies greatly) Roll out into long half inch tubes cut into dumplings and roll each one on a gnochi board. Place on sheet pan with wax paper and semolina till ready to cook. Heat a saute pan. Add EVOO, prosciutto and mushrooms. Cook to lightly caramelize. Add Garlic and cook till garlic starts to color. Deglaze with white wine, reduce by half add chicken stock and cream slightly reduce till sauce coats a spoon. Season with salt, pepper lemon zest and mint. Cook gnudi in salted boiling water until al dente add to sauce and cook another minute. Toss in cherry tomatoes and arugula and parmesan. Toss to combine, serve in warm bowl.